Amulet Books, New York, 2007. 348 pages. Twelve-year-old Dana barely remembers her mother, who disappeared when Dana was three years old. Now her father wants to leave Ireland for a job in his native Canada. If they leave Ireland, how will her mother ever find them? When her father takes Dana to visit some friends, protesting the felling of a stretch of forest, Dana gets a message from faerie. Before long, she's recruited for a quest, a quest to save faerie from the Destroyer who's entered the land. 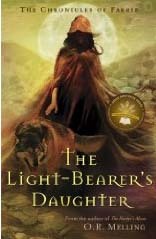 If Dana accomplishes the quest, she can make a wish, and she knows what she wishes for more than anything else -- to find her mother again. The quest is dark and difficult and full of surprises. Dana encounters several surprising helpers along the way, and the end is not what she expected. This is a lyrical tale, set in modern-day Ireland (even including places I have visited! ), peeling back layers of magic and mystery. The author weaves in Gaelic songs and old Irish history, including St. Kevin in Glendalough, giving the reader a sense of place. Reading this book is like taking a magical trip to Ireland.